I use this cupcake recipe for everything. Cupcakes, vanilla cakes, you can make two 7″ rounds with this recipe just perfectly. Bake for about 50 minutes, and you are set. Having a staple recipe is so handy, and this one is great with other flavours added. The frosting.. well it’s a whole other thing! It is divine, and rich, and well, perfect to go with anything. Preheat oven to 175°C / 350°F Line two 12-cup muffin tins with cupcake papers. In a large bowl, on the medium speed of an electric mixer, cream the butter until smooth. Add the sugar gradually and beat until fluffy, about 2 minutes. Add the eggs, one at a time, beating well after each addition. Add vanilla extract. Carefully spoon the batter into the cupcake liners, or fill using a piping bag, filling them about three-quarters full. Bake for 20-22 minutes, or until they spring back when pressed. Combine cocoa and the boiling water, stirring until cocoa has dissolved. With an electric mixer on medium-high speed, beat butter and confectioners’ sugar until pale and fluffy. Reduce speed to low. Add melted and cooled chocolate, beating until combined and scraping down sides of bowl as needed. Beat in the cocoa mixture. Hi! I think your ingredients listed are a bit off, the cupcakes only say one of the flours and the icing doesn’t say “butter” just 250g! Lol! Loving the new site though! 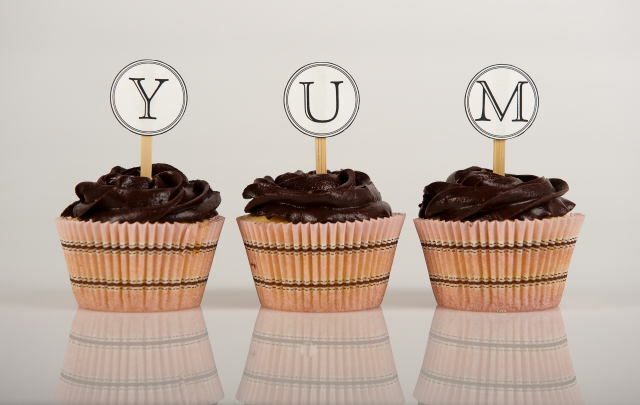 Can’t wait to try this cupcake recipe this week! I’m about to make this cake mix and you mention combine flours in the method, but I can only see 11/4 cups plain flour which doesn’t seem enough flour for the amount of wet ingredients. Is there a quantity of Sr. Flour missing? Yes, sorry, just added, typo! Hi, for cupcales u mentioned cream the butter and add sugar. Theres no sugar in the ingredients section. How much do i add? It says 250g of icing sugar, last ingredient. Hope you love it! I can’t wait to try this recipe, it’s different to any I have tried before. I was wondering if i could use while milk instead of low fat, or there is a special reason why this one is preferred. BTW I live your website. Thanks! What’s the purpose of adding sour cream? I want to put some fondant decorations on these cakes. How many days can I keep the cupcakes? Will it get dry after putting to fridge? Or any tricks to keep its moisture? I place in a container for up to 3 days, you can keep in the fridge if it’s hot, or you want to. I don’t, unless they are iced, and have to be. The adds moisture and density. Hi can I use cake flour instead of all purpose flour? Can i use buttermilk for this recipe to replace the milk? 250 grams of bitter is ?? how many cups? Sorry, in the U.S. Thanks! Sorry how many grams is 1cup of flour and sugar? ?? I don’t use cups! !! Can you use 8″ pans instead of 7″ for this recipe? yes, it just takes less time and bakes a shorter cake. Do you have a vanilla frosting made like this? Thanks! I absolutely LOVE your videos and ideas! I have just recently become addicted to decorating and love every min of it! I have been working on my techniques so I cheat and buy/use boxed cake mixes, which work fine for me but now I want to venture out and try some from scratch so I can make new flavors I love how solid your cakes seem. I know you freeze them, as do I (well, chill in fridge) but my cakes are EXTREMELY moist, not as dense as yours seem, so they tear easily and feel spongy when I do my crumb coat. SOOO…I found this recipe which I believe you use quite a bit and thought I would give it a go. The heading says cupcakes but you use for cakes, correct?? How many batches do you tend to make up to do one of your cakes like the Mandala one you did.? I would like to try it out this weekend so any help would be appreciated! Yes, I use this for a cake as well. One batch makes two 7″ round layers. Hi there, I made these cupcakes following your recipe and they don’t rise very much. Also have cracks on top. Is this right? Thanks. You have to add one teaspoon of baking powder for each cup of plain flour, otherwise it won’t rise. most likely overbeating the batter or undercooking. Vanessa, I’m going to be making a half sheet cake and will use this icing for it. I know I’ll at least need to double it. Would you think that is enough? At this point the plan is not to split and fill so I just need lots of yummy coverage.